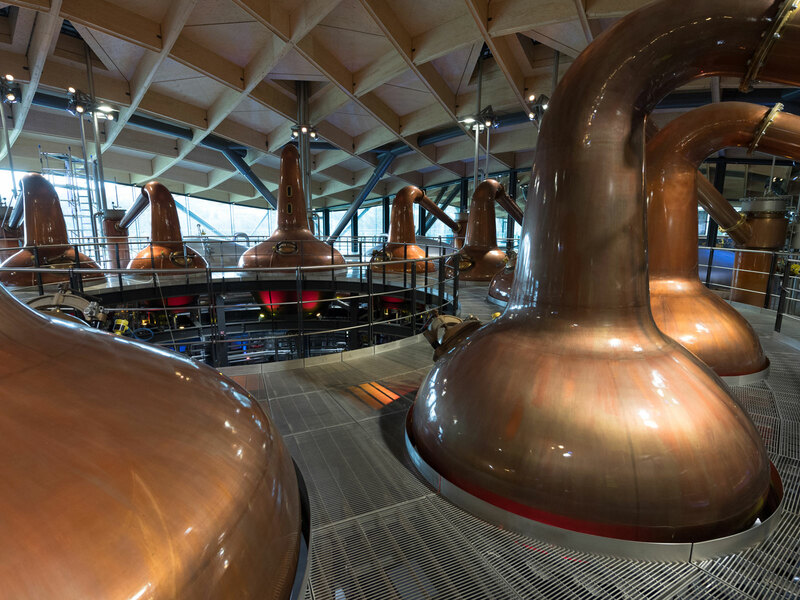 The shrine to matured spirits is the most stunning, state-of-the-art facility in all of Scotch whisky. A series of undulating mounds sinks into the grass, organic edges echoing the surrounding topography — a subterranean lair camouflaged to the specifications of a Bond villain. Inside, beyond the entranceway, a cavernous atrium beckons your neck to tilt back toward the rafters, to spot the lofted ceiling dimpled with 2,500 separate sections of curved wood, held in place by 1,800 beams. Walls are lined with glass, encasing 840 bottles up to 194 years old, displayed like the stacks at an Ivy League library. A console-controlled camera flies on mounted tracks — a ‘video periscope’ providing close-up imagery of selected labels. An uninterrupted 200-meter glass wall frames the Scottish highlands unfurling toward the horizon. 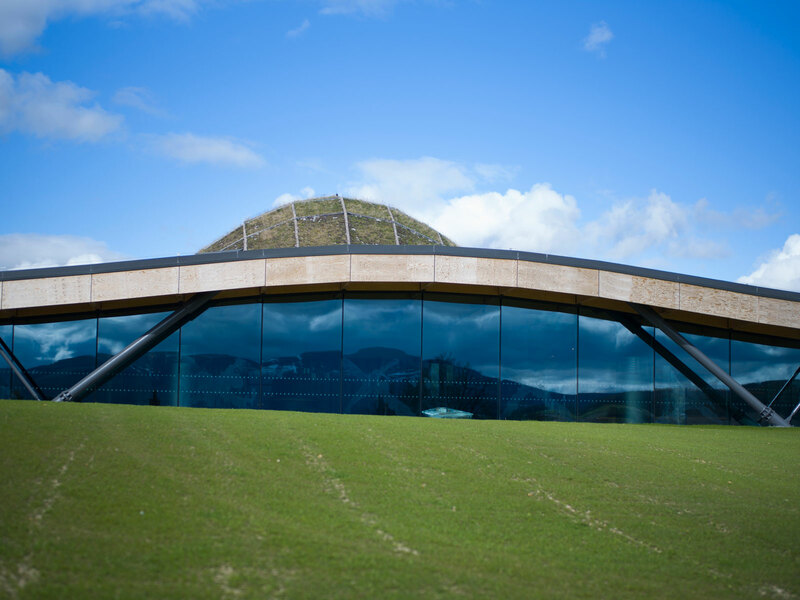 Enter The Macallan's new state-of-the-art distillery and visitor center, which opens to the public on June 2. 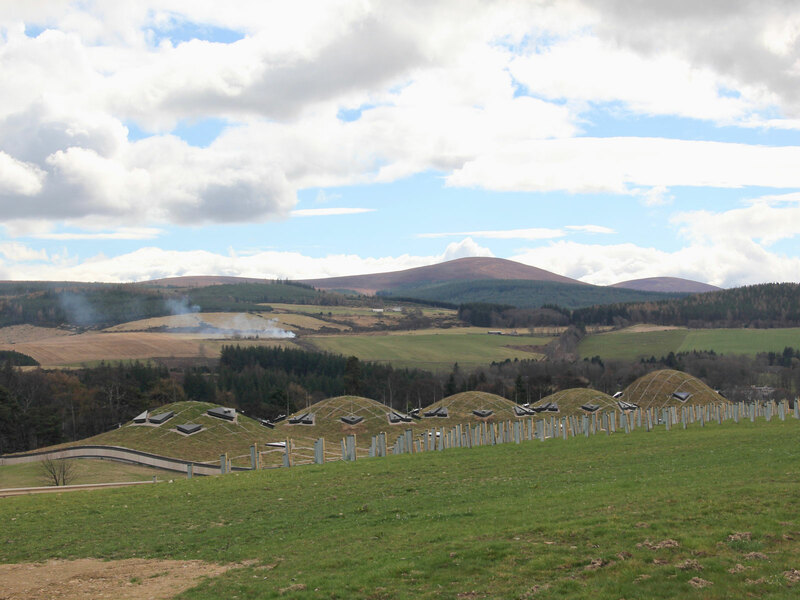 Five years and nearly $200 million in the making, it's a sprawling, 3.6-acre testament to how far the category has climbed in the modern era, and befits Scotch whisky’s most profitable producer. A decade ago, such an elaborate edifice would have been fodder for fairy tales. Today it’s a very real part of the landscape — literally. Starting this June, the center will offer 90-minute tours for groups no larger than 12 people, Monday through Friday, from 9:30 a.m. to 5 p.m. There will be a tour-booking mechanism on the website eventually, but for now, you must call or email to make an appointment. “We wanted to provide our guests with information and history,” says Creative Director Ken Grier. To encourage interaction, novel displays are set up along the tour. Elements of production are revealed when guests hand rotate large metal wheels encircling the installations. In one section, you pass through a series of 10-foot wooden staves, swiveling shut behind you to simulate being in the barrel. “It’s exciting that guests will be able to be immersed into the cooperage experience when attending the new visiting center,” says Stuart MacPherson, the brand’s Master of Wood. “The wood is a big part of our story, with sherry casks attributing up to 80 percent of the final aromas and flavors, as well as 100 percent of the natural color in our whisky.” Here, you don’t just learn what that means so much as feel it. The lessons extend beyond Scotland’s liquid legacy, too. Down the second-floor corridor, a dedicated gallery space will focus on local art. The exhibits are intended to heighten the country’s cultural significance across a broad range of media. With all its visual flourishes, it could be easy to forget that this is a working distillery. But the stillhouse’s massive copper constructs — forever looming large over your shoulder — have a way of constantly reminding you. A fire-protective glass wall is all that separates the visitor experience from the production area, and the tour eventually works its way across its grated catwalk, affording an intimate glimpse at live whisky-making. Yes, this stunning site is a veritable workhorse: gracefully curved metal arms are arranged in three separate operational rings. Suspended one story above the ground, the four wash stills and eight spirits stills forming each circle are lit red from below to maximize dramatic impact. Production began here in November of 2017 and is already outpacing its now-"mothballed" predecessor by 15 percent. A modular design means that its back wall can be blown out to accommodate future rings of pot stills as needed. The outsized operation is intended to help satisfy the unprecedented demand for premium Scotch malt. But updated equipment carries with it the challenge of ensuring the new distillate pumped out here matches the old. Master Distiller Nick Savage is charged with the all-important task of maintaining continuity. “The new distillery will allow us to accommodate for future demand at no cost of quality,” he tells Food and Wine. “We have kept our whisky-making process the same, including our distinctive, ‘curiously small’ stills known to the brand. They are the exact same shape, size and lyne-arm orientation as those used in the previous distillery and have been made by Scottish coppersmiths, Forsyths [the industry standard in pot still manufacturing].” Equipment forged for the project required the largest single order for copper in the company’s 128-year history. At any rate, the majority of The Macallan’s allure — and flavor — is imparted in the barrel. And nothing figures to change in the wood department. “As a company, we spend more money than any other brand on our casks and our heavy investment in sourcing, crafting, seasoning and caring for casks is unmatched,” MacPherson promises. Bolstering the claim, The Macallan will construct more than $200 million worth of on-site aging warehouses over the next decade — providing all that new liquid with ample space to rest. In the meantime, visitors to the property will enjoy unrivaled access to the vast portfolio that made The Macallan a top name in whisky. Front and center on the building’s second level is a rounded bar, flanking circular shelves of bottles — 952 in total, available by the pour. The area is adjoined by lounges, for private tastings, and a hidden underground barrel gallery. And it’s not just for show: wealthy collectors and connoisseurs will scurry to secure a supremely limited number of casks held here in bond. A dozen years from now, they’ll return to collect their bottled bounty.